Well March has come and gone in the blink of an eye. I have to start this post with a sincere apology for the lack of posting in the past month; there has been a lot of travelling and eating going on in the world of The Food Girl In Town and I have so much to write about I don’t even know where to start! That being said, it does not excuse my delinquency in talking about everything that I eat like I normally do. April is here and look out, there is lots to be discussed and drooled about! 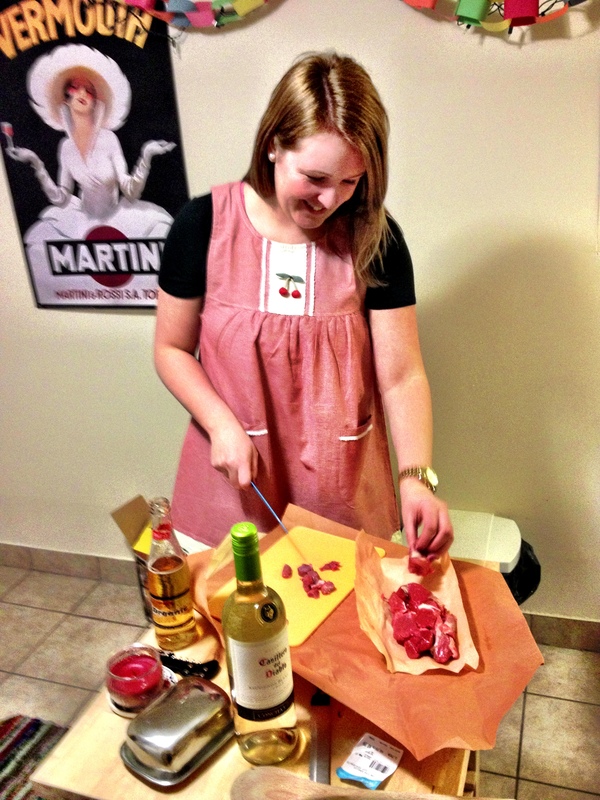 First things first: FOOD AND WINE COVER RECIPE CHALLENGE! The moment I saw the cover of March’s Food & Wine magazine, I knew the monthly challenge was going to be awesome. March’s issue revolves around the all-time greatest recipes from legendary cooks like Julia Child, Jacques Pepin, and of course Marcella Hazan, whose recipe for Pasta with Abruzzi-Style Lamb Sauce graces my cover of F&W this month. Apparently there is also another cover floating around making readers drool over roasted chicken, so make sure to check out the other Recipe Cover Challenge bloggers and their postings about March’s cover recipe. I love Marcella Hazan. You may remember my New Year’s Day post about the 6 course meal that Adam and I made using one her great cookbooks, and I was pumped to make another one of her delicious dishes. Adam is also a huge fan of lamb, so I knew it would be a hit with him, and my other taste testers Erin and Matt, who are once again along for the ride this month are also big fans of Italian food. 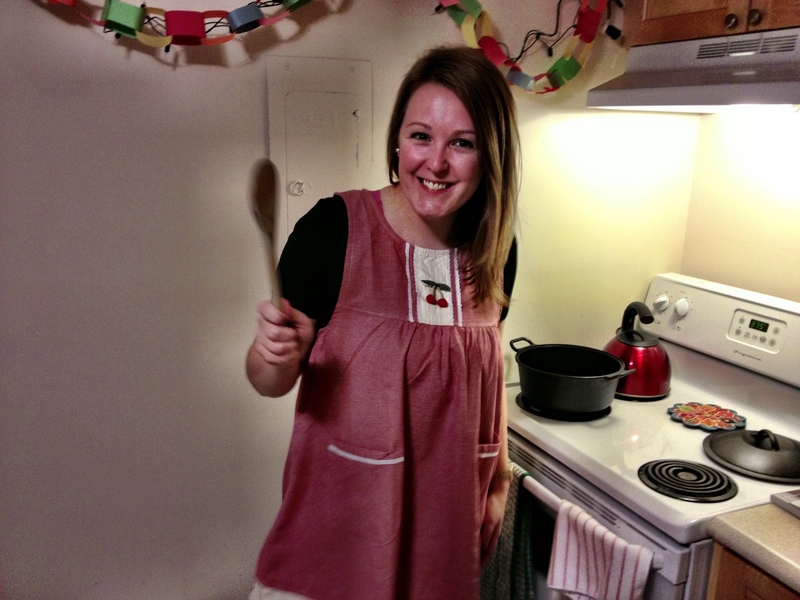 With my wooden spoon, flowy apron, and my diced lamb, I found my inner Nonna and I was all set for another Italian adventure with the ultimate Italian chef, Marcella Hazan. Andiamo! I have to say, this cover recipe was probably one of the easiest, and the best tasting so far! I am almost sad that I gave last month’s recipe a perfect score, because this one was even better: It tasted amazing, it did not require a large amount of prep, and it was easy to make. For the sauce, all that was required was the dicing the boneless lamb shoulder, followed by frying up the onions, pancetta, and rosemary and combining all these ingredients with tomatoes, white wine, and pecorino romano. Simple. It smelled amazing while it was cooking and the prep time was very fast. Once the sauce was simmering, the only other requirement was to boil some penne and combine all the ingredients to be topped with even more pecorino romano cheese. Delicious and easy! In addition to the main dish, I decided to chose a starter salad from the plethora of fantastic recipes that were featured in this month’s issue. I picked one of Jamie Oliver’s salads that was chosen by F&W to be the ‘Best First Course Salad.’ The Roasted Carrot and Avocado Salad with Citrus Dressing was a fresh and interesting combination of ingredients, but it required more prep work than the main! This is the one complaint I have about Jamie Oliver’s recipes: I have prepared a few dishes from his cookbooks and I find that there is a lot of prep work involved in his dishes. His instructions tend to be lumpy and complicated as well. Granted, the results are always delicious, but it can be exhausting to spend over an hour preparing a first course salad! 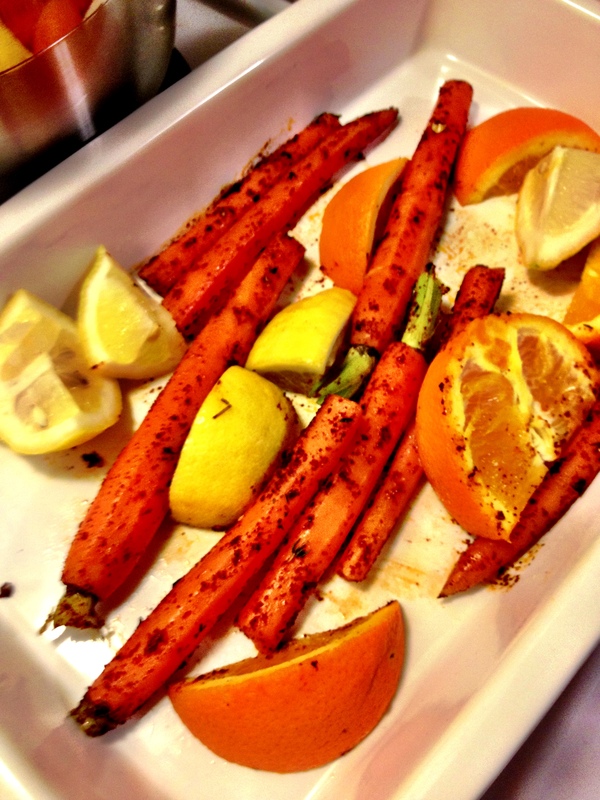 First, you have to boil the carrots, then you have to use a mortar and pestle to ground up a variety of seeds and spices to make a rub for the carrots which you then roast in the oven with lemon and orange. While the carrots are roasting, you have to toast ciabatta bread and make croutons. 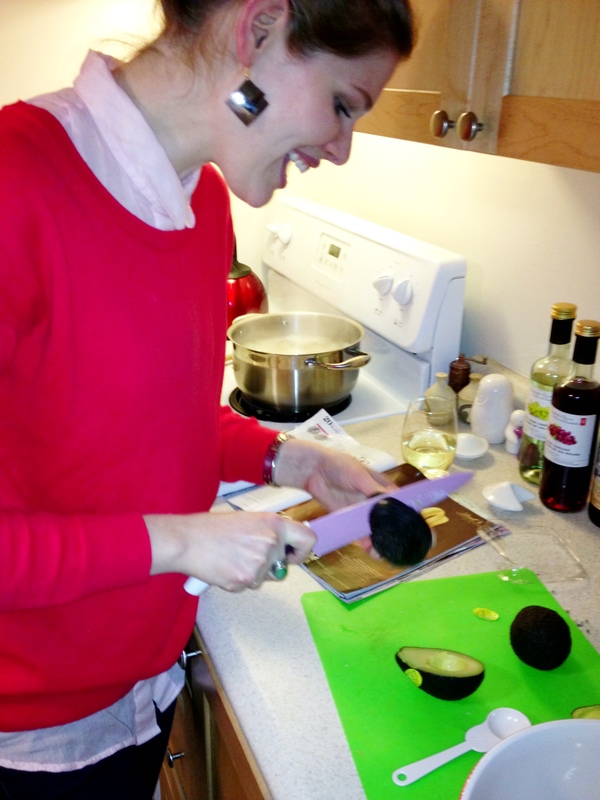 Erin showed me a great way to slice the avocados without mushing them up. I am always the worst at choosing fresh avocados for use in the same day, and I was so happy that I just happened to pick three good ones that morning so that Erin could show me a couple of tips about removing the pit and slicing the avocado just so. After this, the dressing is made which includes the hot orange and lemon from the roasting pan, red wine vinegar and olive oil. 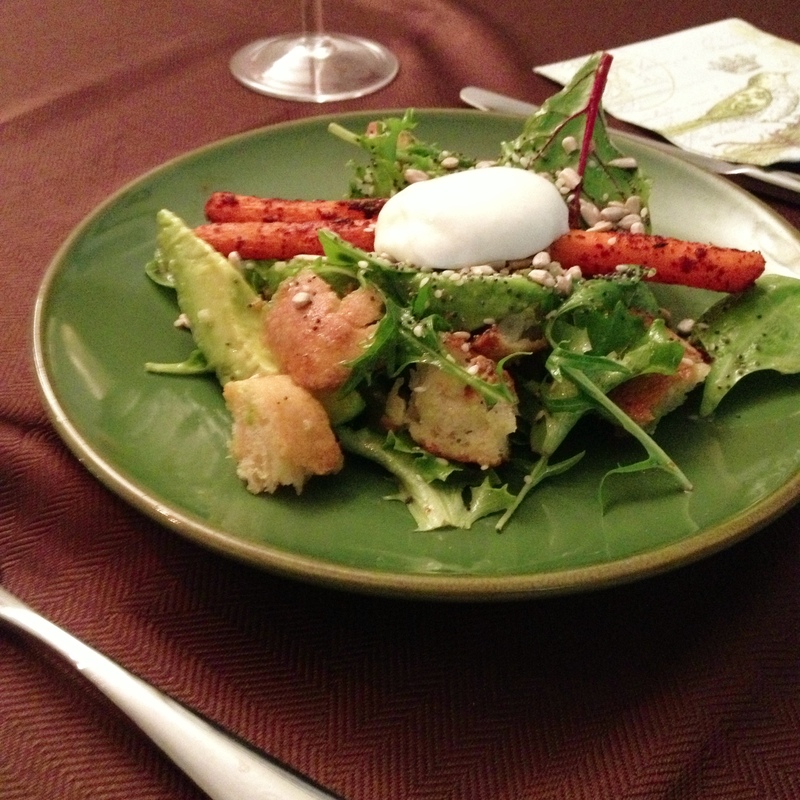 Once all the ingredients are prepared, the carrots and avocado are plated on a bed of greens and dressing and topped with more of the seed mixture and sour cream. Voila! The first course salad was a big hit. One would think that the combination of warm carrots, avocado, red wine vinegar and sour cream would just be a big mess, but somehow it wasn’t. The freshness of the citrus, combined with the poppy and sesame seed garnish brought the ingredients together in a unique and delicious way that only Jamie Oliver could have conceived. Everyone really enjoyed the salad, even Adam who really does not like carrots very much. The salad disappeared off our plates quickly and we were ready for the main! The aromas of the sauce had already permeated the dining room by the time the pasta had been plated, and it only added to the amazing flavours of the Abruzzi-style lamb sauce. The richness of the lamb complimented the tomatoes and made for a robust tasting sauce, and combined with the strong flavour of the pecorino romano, made for a very strong and delicious main. 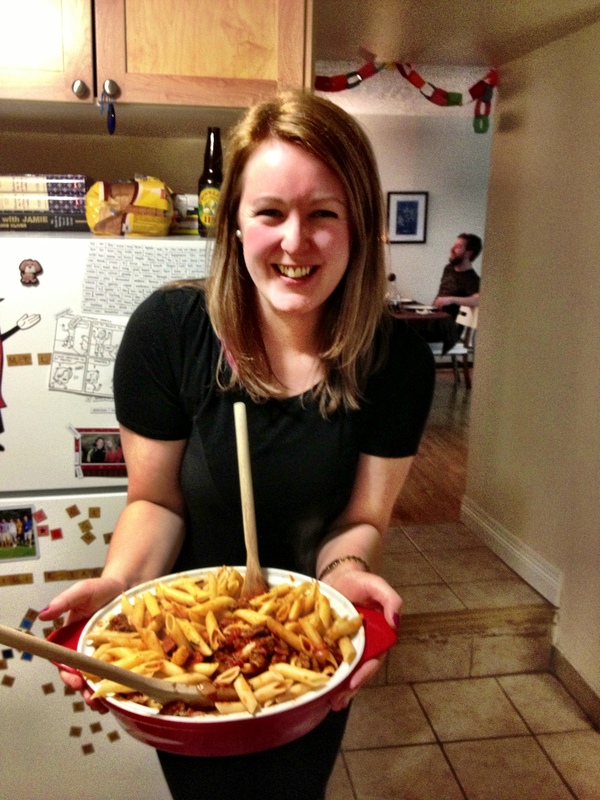 The only criticism about the dish is not really a criticism as much as a personal preference: I found that the sauce could have stuck to the pasta a little better, and I would have preferred to use a linguini or spaghetti noodle because I find penne does not mesh well with tomato based sauces. Next time I make this (because there will definitely be a next time) I will use linguini. For the first course, Erin and Matt brought a great Italian white wine to complement the citrus salad. 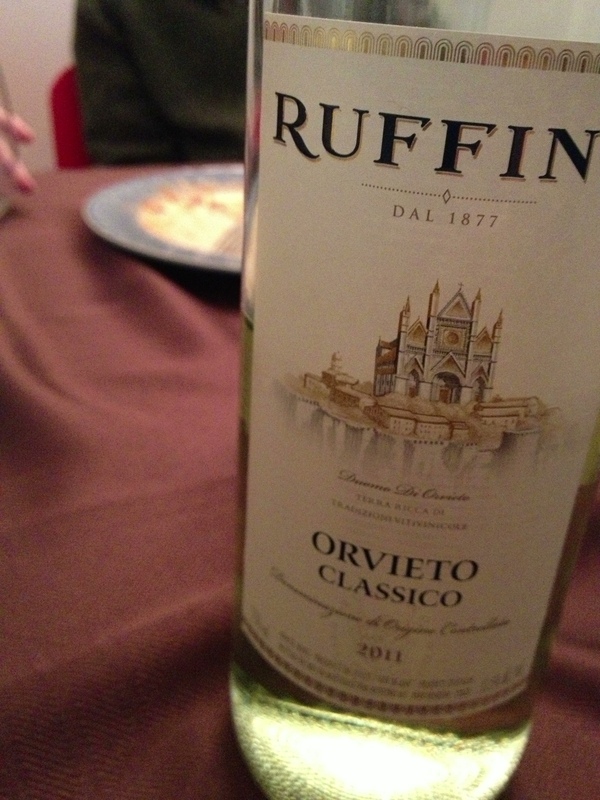 The Ruffino Orvieto Classico is a fruity white wine that matched well with the fresh ingredients in the salad. The lightness of the wine paired nicely with the avocado and the carrot and gave a refreshing summery feeling to the first course. For the main, I chose a Valpolicella to compliment the strong flavours in the sauce. 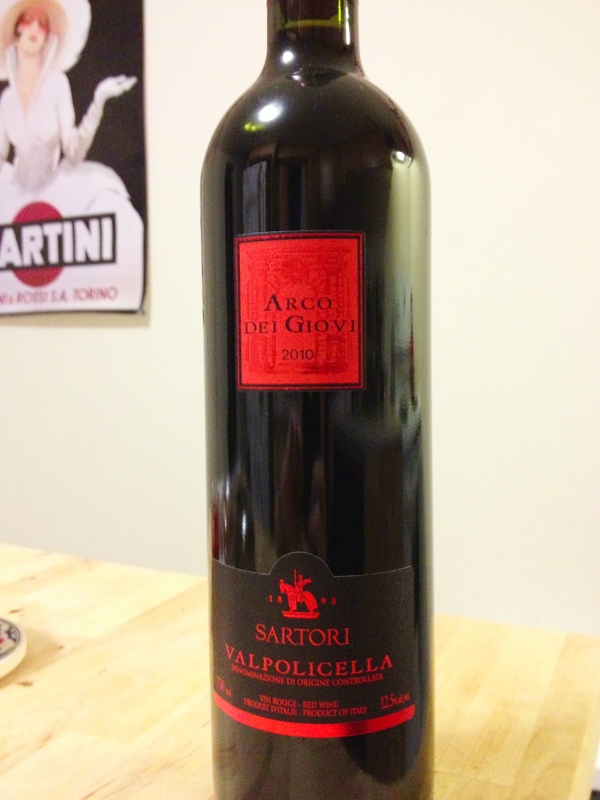 The Sartori Arco Dei Giovi Valpolicella had a sweetness to it and was light enough to pair with the dominant essence of the lamb and the pecorino romano, which are both strong flavours. I hope that you all find your inner Nonna like I did and Explore. Eat. Repeat. 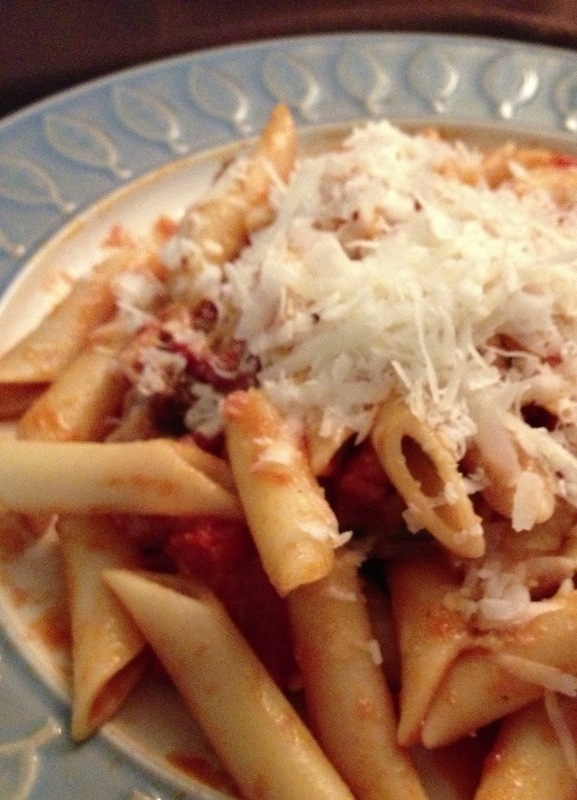 Marcella Hazan’s great recipe! Buon Apetito! *The Food & Wine Magazine Cover Recipe Challenge was created by CookThatBook.com as a means of expanding culinary talents and tackling new and exciting cuisine. Want to join in on the fun? We’d love the company! Pick-up a copy of the latest issue of Food & Wine and get cooking. Be sure to send an email to info@cookthatbook.com with a link to your blog post. *The mission of Food & Wine Magazine is to find the most exciting places, new experiences, emerging trends and sensations in the culinary and wine industries. From travel and entertaining to luxury and design, this magazine brings an energetic and stylish take on food and wine. For more information on Food & Wine Magazine, please visitwww.foodandwine.com. And down right enjoyable. Keep up the good work.